As far as the quality of the care I received is concerned, I can only say that it was exemplary and I suppose not at allthe level at what we the public are led to believe when reading press reports and some other people’s opinions. When I inform anyone I speak to (especially in the Sandwell area) they seem to be very surprised, as the general perception appears to be that Sandwell hospital is not one they have very high opinions about. This is an opinion that I feel needs to change. There is nothing at all which I feel would need to change about the quality of the care afforded to me and I truly believe that if I had chosen to pay for private health care I certainly would not have been in a position to afford or even find the same level of care elsewhere. At all times whilst in hospital I felt I was in safe and knowledgeable hands. All staff showed what felt like a genuine concern for me at all times. Even when I was feeling down this genuine feeling of concern was very important to me. They also made me feel that no matter how hard things were they would always improve and there is a worthwhile future. I suppose it made me feel that if so many people who hardly know me can care so much, then I must work as hard as I can to make it worth everyone’s effort. They also made me feel like my wife was being cared for and kept informed at all times about my recovery, this was very important for me as I felt my wife, as much as me, needed to be able to see light at the end of the tunnel. Everyone was also prepared to have a laugh and joke and, as I have always had a sense of humour, this was a very important part in the day of me as a stroke victim. Maybe some other people can’t be so cheerful in the same situation but it was important to me. I was also made to feel that nothing was too much to ask and they all had time for me even when, looking back, I could see just how busy they all were. The way I was being treated quite simply made me feel very humble. Dignity is also very important to me, so very early on (within the fit day or so) I decided that if I was going to get through this I would have to give a little bit of my privacy and dignity away. This was not a problem whatsoever as all staff who dealt with me treated in a dignified manner. I suppose one of the first things I had to relearn was how to use a knife and fork again and I can recall trying to use a fork with my left hand (my affected side). Someone sat with me and helped me to cut my food whilst showing a massive amount of patience as the fork just kept slipping out of my hand, through patience and understanding I was eventually able to do it well enough to enable me to perfect it when I returned home. My left hand was virtually useless and one moment that stands out in my mind was the time my wife was visiting and she got talking to a nurse about the book ‘Fifty Shades of Grey’, as you can imagine it was a little risqué and very jokey, the nurse gave my wife a cable tie as a joke. After visiting I managed to knock the cable tie on the floor. The nurses saw this and challenged me to pick it up with my left hand. I couldn’t pick anything up with my finger and thumb at this stage but it became such a challenge and so funny (considering what a cable tie meant in the book) that a good thirty minutes and a lot of cheers from them that I eventually did it. Little things like that meant so much to me. After that I spent literally hours sitting by my table picking things up with my left hand always being encouraged by whoever was around. Walking was probably the most important part of my rehabilitation for me and I had to literally learn how to walk again. They (the physiotherapists) made me feel so confident that it would improve given time and effort. Once again I could hardly wait to tell my family. Over time I was able to improve to such an extent that with my wife holding me I was able to achieve a goal I set to walk out of the hospital before Christmas. I think all the care I received was beyond the call of duty. I have had equipment and modifications to my home to enable me to carry out tasks safely at home. This is contrary to other people I know in other areas. I would very much like the opportunity at some stage to be able to visit the ward and say thank you in person to everyone involved in my care and hopefully I can maybe give something back to the wards in the future (either through fund raising or voluntary help). 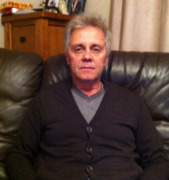 The above account is from Steve Jones, who was admitted to Newton 1 at Sandwell Hospital on 9th December 2012 with an Acute Stroke.